Wholesale Trader of a wide range of products which include autofy indicator lights for bikes. Autofy stylish indicators with White colour having LED inside is now available at a low and reasonable price. These indicators can add style to your Splendor Plus. It is made of premium quality plastic with consumes very low battery power giving it long life and faster On/OFF response time. The installation process is very easy, directly mounted bolts connected to wire harness offers plug and play functionality. Each indicator / turning light has LED fitted with White colour to provide a clear and bright light for better visibility. The mechanism does not drain battery because of the low power consumption technology thereby giving your bike a healthy and long battery life. This is a must have accessory for biker boys having Splendor Plus bike. 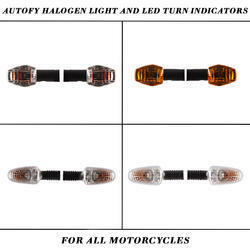 Autofy also offers indicators for Bajaj Avenger and Royal Enfield Bullet, Royal Enfield Classic 350, Royal Enfield 500, Thunderbird Royal Enfield Twinspark, Pulsar, Duke KTM, Harley Davidson, Yamaha FZ, R15, CBR, Ninja, Apache, Hayabusa and other bikes.